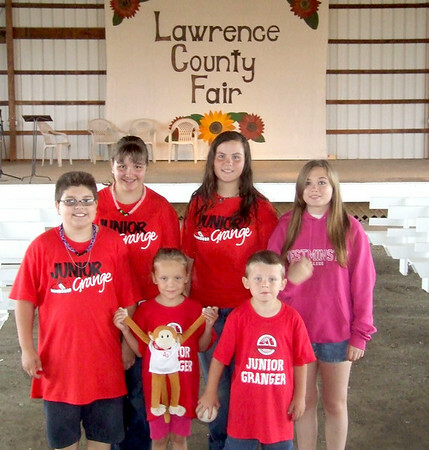 Junior Grange members were on hand at the Lawrence County Fair yesterday to lend a hand with games for children. Shown above are: front row, from left, Eric Jones, Haley Porada and Chase Kosciuszko. Back row, from left, are Lila Jones, Mackenzie Kushma and Jordan Comstock. Haley is holding Jammin-George, the state junior grange mascot, which is visiting the county fair.